Rooted in history and brimming with style, the latest introductions from the UK blend iconic patterns with new original offerings. 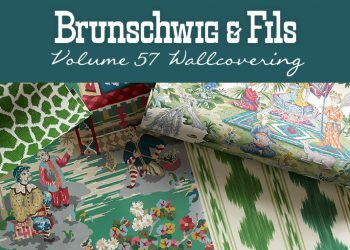 Beautiful, iconic fabric designs originating from the renowned GP & J Baker archive have been creatively translated into this superb collection of wallcoverings. 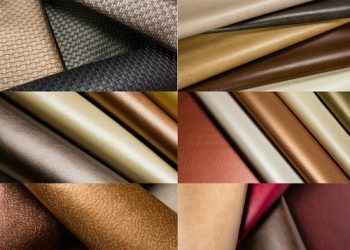 The new, modern color palette ranges from light and subtle to the romance of glorious deeper shades. 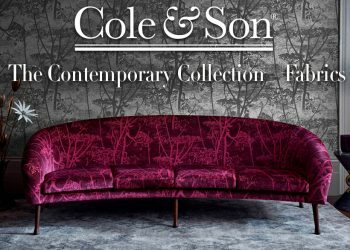 Gorgeous adaptations mixed with striking geometrics round out to create stunning pictorial patterns in this versatile collection. 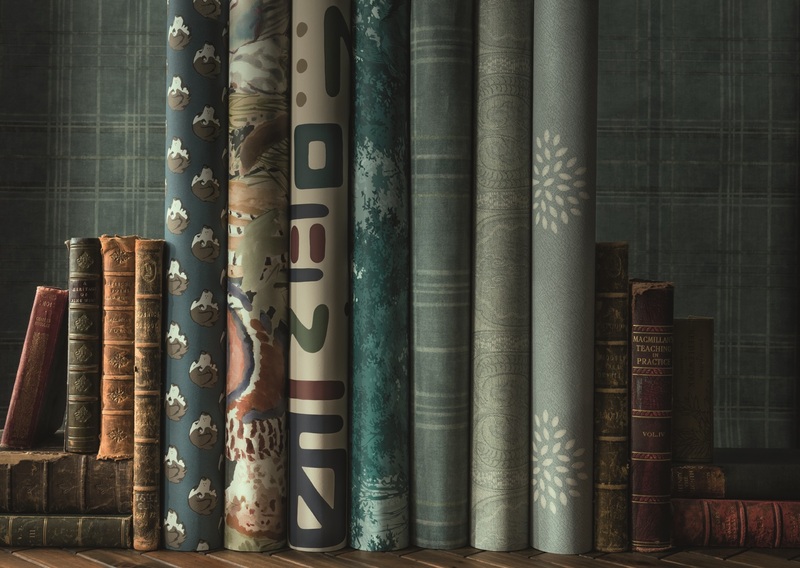 The wallcoverings make fabulous, individual statements, or work exceptionally well with other GP &J Baker collections. 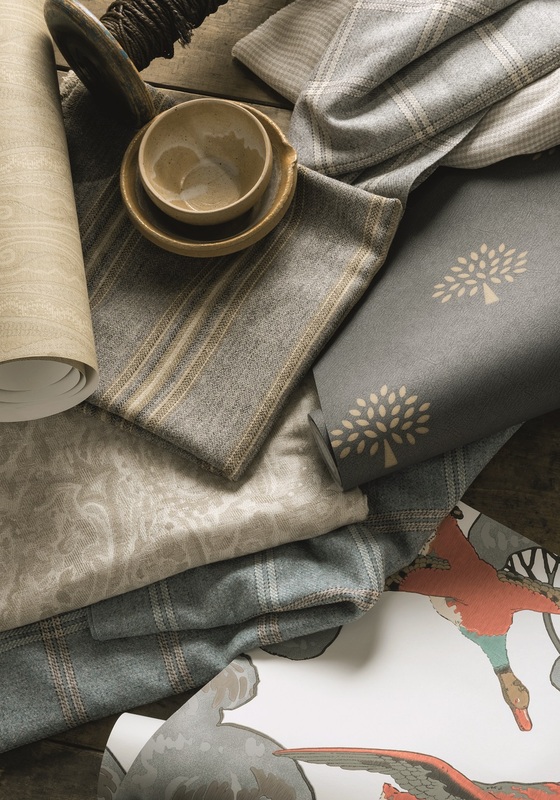 This enduring GP & J Baker classic was created exclusively for the company by the renowned British textile designer William Turner in 1915. 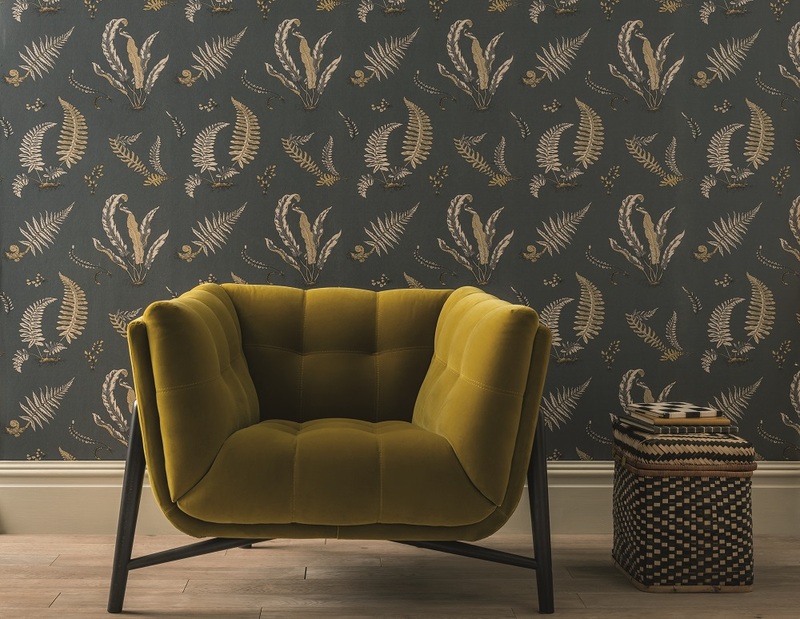 Inspired by a 15th-16th century Ming dynasty painting on a silk panel in the British Museum, this design shows drooping lotus leaves and birds contrasting the patient stillness of the egret with the quick decisive movements of the kingfisher. “Ferns” was created by the textile artist Joseph M. Doran and purchased by GP & J Baker in 1935. 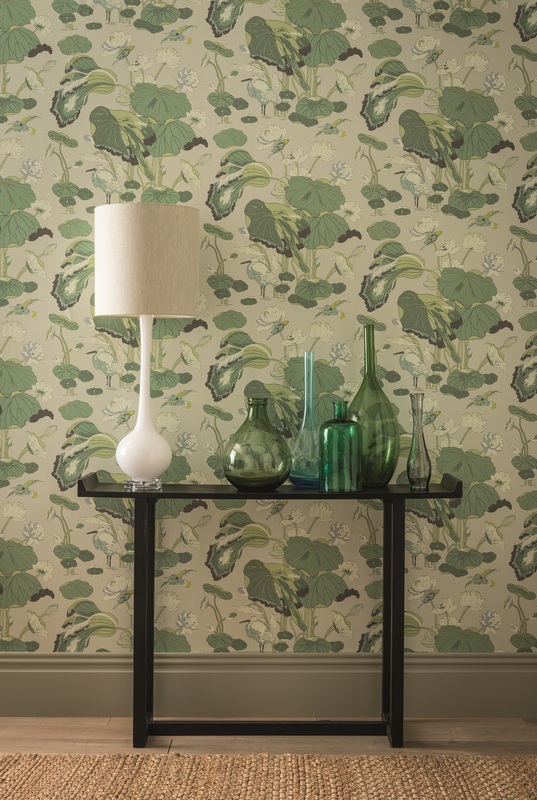 The design is based on botanical drawings published in Curtis’ ‘Flora Londinensis between 1777 and 1798, which was a record of plants growing within a ten mile radius of London. Skillfully re-interpreted from an early 19th century Chinese wallpaper, this charming design was drawn from several panels in a “Chinese Room” of a house in St Paul’s Cray, Kent. 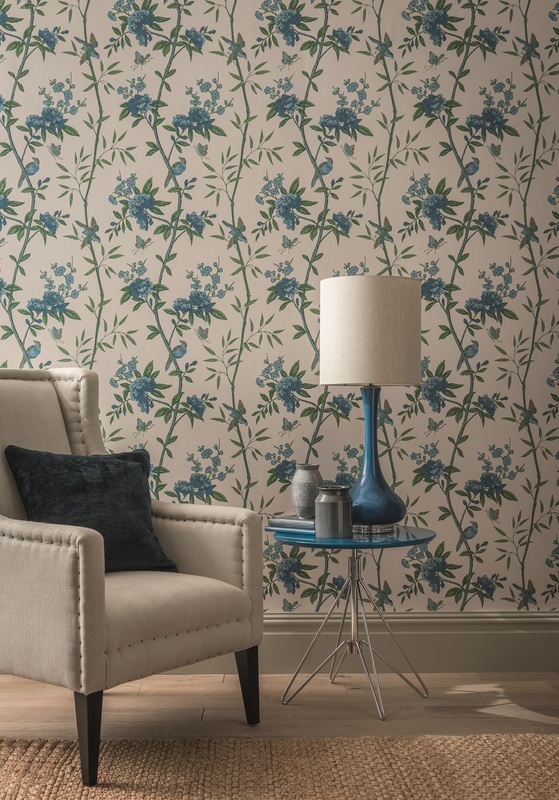 It features a spectacular trailing floral design of magnolia and peony blossoms entwined with blossom trails and interposed with captivating birds, dragonflies and butterflies. 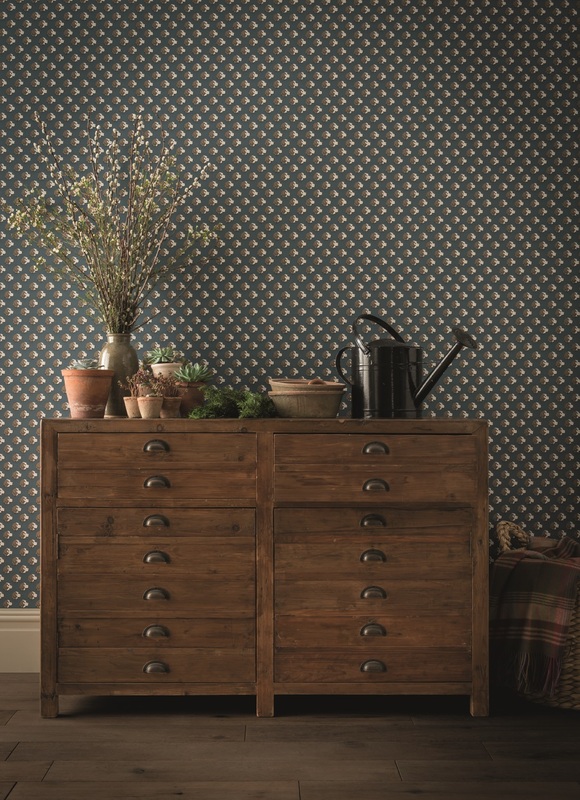 Modern Country by Mulberry Home takes a fresh approach with this outstanding new collection of beautiful textures and wallcovering designed for both traditional and contemporary country houses, instilling the peace and tranquility of the countryside into any town interior. The serene palette focuses on nature’s gentler, organic colors ranging from classic quiet neutrals to deeper shades of teal and indigo. Walton is a beautiful lambswool and pure wool window pane check on an attractive tweedy ground. Fairfield Braid is a rich velvet trim in four harmonizing colors is the perfect companion to all the wonderful fabrics in the collection. Belmont is an extremely smart tonal stripe in wool and linen has an appealing robust herringbone ground. Adlina is an intricately woven wool jacquard with a decorative framed Indienne cartouche. 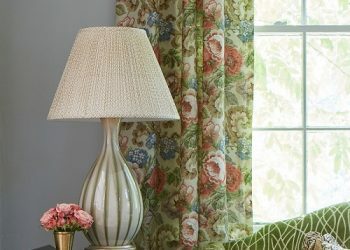 Claremont is a beautiful lightweight fabric, in a blend of wool and linen, and woven as softly blurred multi tonal stripes. 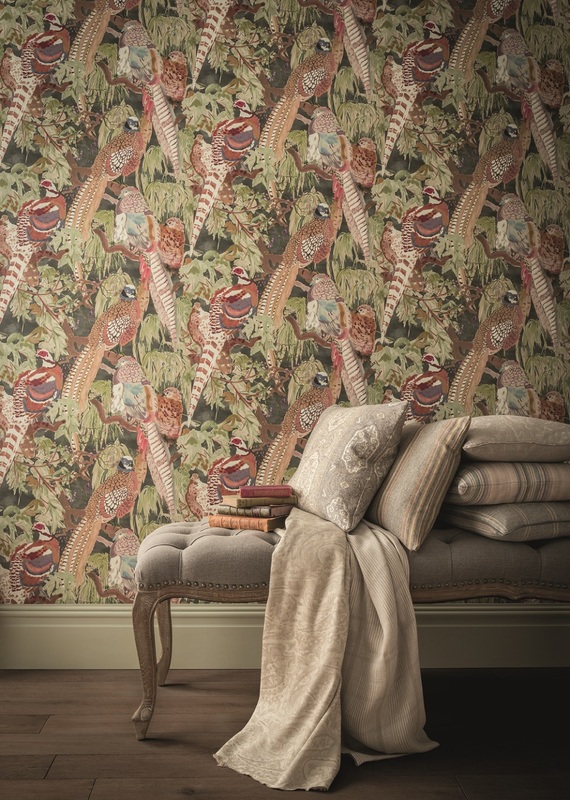 These fabrics are complemented by Game Birds wallpaper, a wonderfully realistic pictorial of British game birds at the height of the season in a woodland setting. Originating from a late 1920s Alfred Stone design, this design echoes the last days of the Art Deco era. 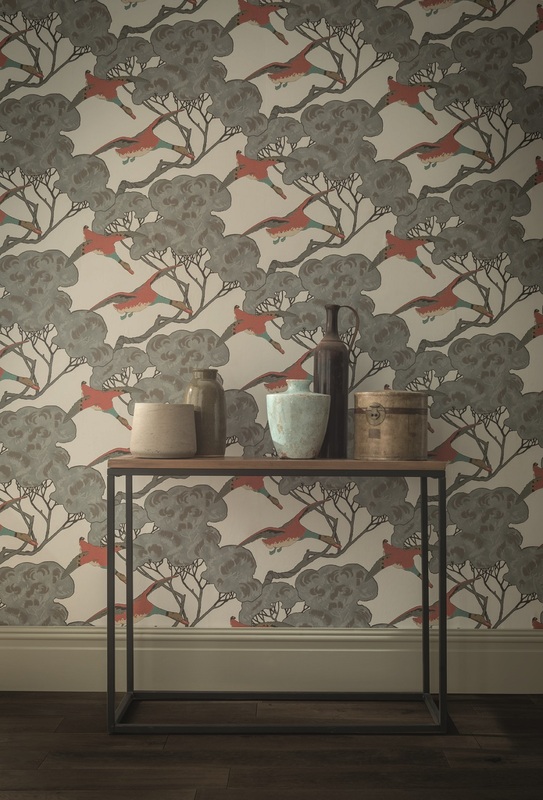 One of Mulberry’s most celebrated designs, this iconic image shows a pair of mallard ducks in majestic light against stylized silhouetted, trees and distant, misty pagodas. 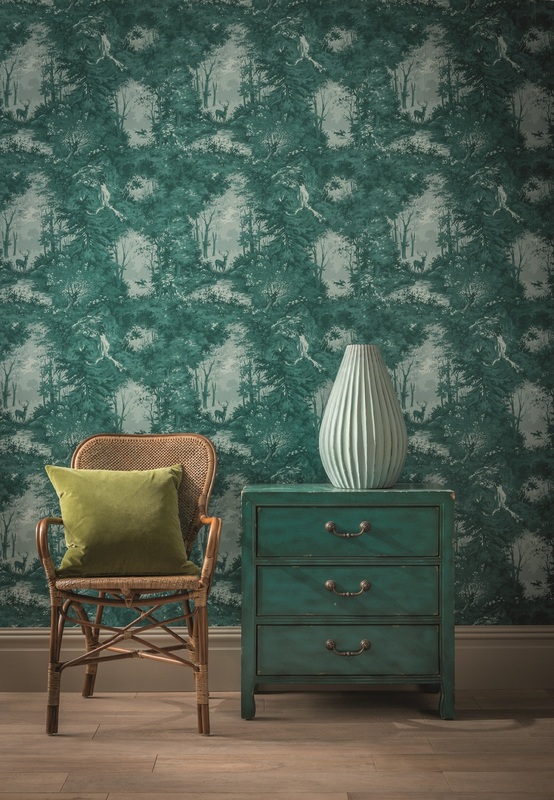 Taken from a document discovered in Paris in the late 1800s, this striking Mulberry fabric design, depicting deer grazing in a romantic highland forest, is made more graphic and modern with its own fashion-forward color palette in this exciting wallpaper version. This pattern features six hounds’ heads, each one slightly different from the others. It is one of several archival designs dating from the mid-1800s entitled Sporting Pursuits. 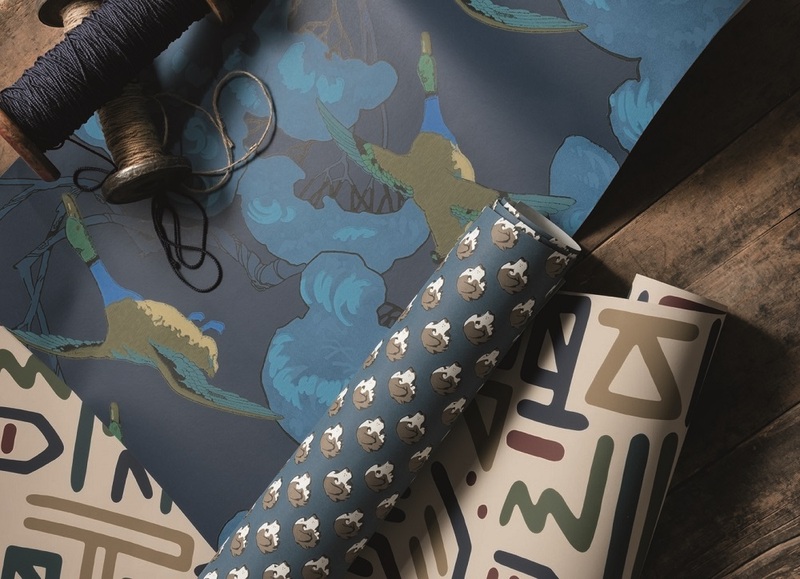 They form an appealing, regular pattern on this unique and whimsical paper. 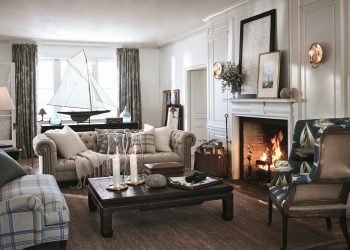 Explore the latest from GP&J Baker and Mulberry Home.